To capture the light, control the view or design with shapes, windows can create a scene within your house that allows you to see more of what you want outside or just feel more protected inside. 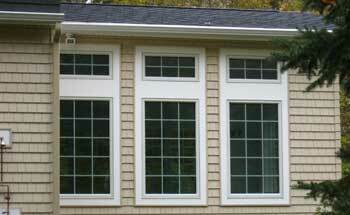 Learn what type of window fits your home, whether it be awning windows in your sunroom, a double-hung window in the bedrooms, a picture-fixed window for the family room, a bay window for the kitchen or gliding windows in any of your rooms, Wyeth Woodworking and Remodeling will get you started with all the information you need. Windows can drastically improve the resale value of your home and reduce your heating costs exponentially. They offer safety and comfort as well as aesthetic. Wyeth takes this process very seriously, and will offer a list of preferred vendors with exceptional service records and experience. Upon installation, contractors will show you how to care for your type of window from cleaning to finishing. A window brightens any home, whether traditional or contemporary, and should be chosen and installed with the same integrity as every other major structural piece. Trust Wyeth Woodworking and Remodeling when researching window furnishings for your home.